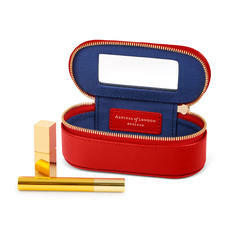 Invite a slice of luxury into your beauty accessories with Aspinal of London's Lipstick and Handbag Tidy All. While perfectly proportioned to hold your lipstick or lip gloss, it also acts as a versatile catch-all case for headphones, contact lenses and any other daily handbag essentials. A myriad of striking shades will speak to your individual style, while the premium leather and shimmering grosgrain lining exudes quality. 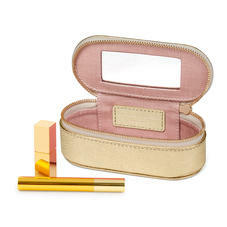 The zip closure and handy internal mirror make this pouch indispensible. Part of the Aspinal Beauty Accessories collection, this is a unique Aspinal design idea to help every lady keep their handbag organised. Our Handbag Tidy All is small enough to take anywhere in any bag and just large enough to hold almost anything. Use it as a lipstick, gloss and essential make up case, hold your contact lenses in, keep your earphones and wires for your mobile or iPod. There are a thousand ways for every girl to use this most useful and wonderful little case - and of course it has a smart little mirror. We think this little case is possibly one of the most useful additions to any ladies bag and once tried will be an essential must have.